Pretty Chit Chat: Things to make you happy. We've all been there.. you sit there for at least 20 minutes not doing anything and your mind decides to take a wonder into that bad memory box in the back of your brain, opens it up and all of a sudden, you feel crap. Or, if you're like me, it tends to be that one thing goes wrong and everything then goes wrong which is just really annoying. I had one of these days lately and I just sat there and thought about all the things that get me out of this phunk I've got going on. Just a few thoughts but I thought I would share them! Even if its touching up your make up or going to get a drink. When you move, your brain has to think about what you're doing so you stop thinking about what you originally were thinking about. Smart aye? So this is a varied one. If you think that you actually have an issue then talking to someone and hearing their aspect on the topic can really help change your mind or make you feel better. If you know you're having just an off day, just try to ignore it, don't feed the bad day with telling everyone about because it then puts you in the frame of mind that nothing is going to go right. A lot of people when they're in bad moods just want to go and eat junk and forget everything but in turn, you then feel really crap afterwards because you've eaten crap food. Find a healthy balance, whether its a piece of fruit and a chocolate bar or a low cal chocolate treat, you get the satisfaction with out the guilty aftermath. Think about that time where you laughed so hard that you were crying. Whenever I think about those times, I automatically have to have chuckle to myself. Even if you go through some photos of that hilarious night out you hard, think of the good times, not the bad! Just a few thoughts if you're ever feeling down. 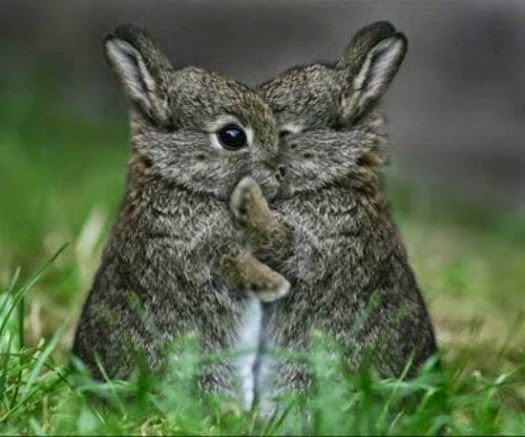 IF YOU'RE FEELING SAD NOW, HERE'S A PICTURE OF TWO BUNNIES CUDDLING! AH! Such a lovely post, I'll be remembering this for the future! I'll be sharing it too, I think it could really help some people! i am so guilty of making myself feel even worse by putting on the saddest music I can find. Horrible I know!! The funny thing is, I keep that picture on my phone to look at if I get in a bad mood - no one could be sad after seeing that!